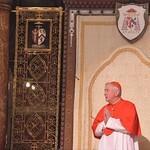 When it was announced in January that the Archbishop Vincent Nichols was to be elevated to the College of Cardinals, the faithful of the three dioceses with which he had been most closely connected made a collection to honour the event. The Cardinal asked that this be offered in his name to the suffering Church in the Holy Land through the charity that he had helped to found, Friends of the Holy Land, and on 14 May, Cardinal Vincent presented the charity with a cheque for £85,000. Friends of the Holy Land concentrates on smaller, sustainable projects that quickly make a big difference to local Christian families, especially the most vulnerable. The charity’s projects fall into four main categories, education, employment, health and housing, and FHL plans to use the Cardinal’s gift on a project to build ten affordable apartments for Christian families in the Bethlehem area and on improving water storage for local families in the same area. Cardinal Vincent reaffirmed his support and prayers for Christians of the Holy Land. He invites all the faithful in the Diocese to pray with Pope Francis during his visit to the Holy Land. A Holy Hour with Exposition of the Blessed Sacrament will take place on Sunday 25 May at Westminster Cathedral, as well as parishes around the Diocese. The Holy Hour will take place from 3pm to 4pm, to coincide with Pope Francis' meeting with Christian communities in the Holy Land. We are all invited to pray with Pope Francis in his mission of peace and with our Christian brothers and sisters in the Holy Land.